Model 20 Electroscope - FREE SHIPPING! The Model 20 Electroscope is an excellent choice for the treasure hunter who needs a tool that has all around performance in the field. 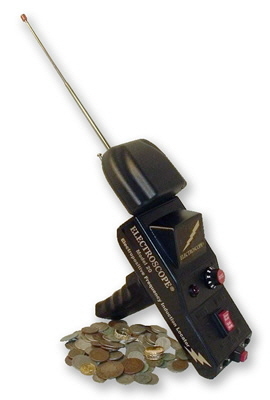 The Model 20, the result of years of research and development, is designed specifically for locating unknown targets such as gold, silver, coins and various relics. Although used by many professionals, it is also an excellent choice for the novice treasure hunter. Featured with a one mode switch for All Metals/Gold and Silver, the Model 20 has a maximum range of one mile, and a depth of six feet. This instrument is becoming widely popular with metal detector enthusiasts looking for an edge in the field.